Abstract: Some of the assays actively developed in a Lab-on-a-Chip format require temperature control, mostly heating to a specified range for the duration of the assay. In a highly portable system with limited power supply, heating microliters of liquids poses technical challenges, which may be costly to overcome solely by experimental means. The way computer-aided design helps in rapid prototyping, so does finite element modelling help in validating the functionality of these prototypes in silico, saving time and costs. The model we present was developed for the geometric optimization of Lab-on-a-Chip devices and tested for experimental setups emulating the targeted device format. The model is presented for multiple temperature control scenarios, i.e. heaters and device geometries. Summary: The presented finite element model aims to help in the development of Lab-on-a-Chip devices which require temperature control. The model simulates the thermal system in such devices to enable in silico validation of designs and geometry optimization, and aims to be a versatile tool supporting multiple temperature control methods. Pardy, T., T. Rang, and I. Tulp. 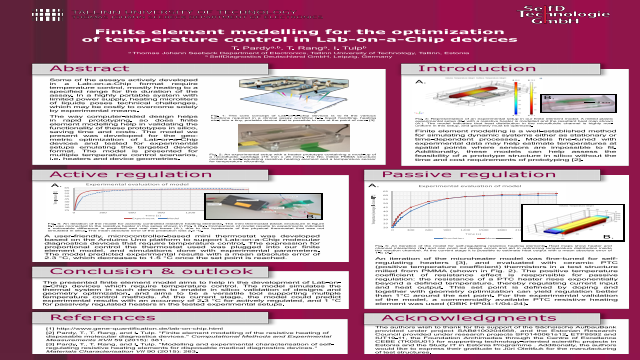 "Finite element modelling of the resistive heating of disposable molecular diagnostics devices." Computational Methods and Experimental Measurements XVII 59 (2015): 381. Pardy, T., T. Rang, and I. Tulp. "Modelling and experimental characterisation of self-regulating resistive heating elements for disposable medical diagnostics devices." Materials Characterisation VII 90 (2015): 263. B. Huybrechts, K. Ishizaki, and M. Takata, “The positive temperature coefficient of resistivity in barium titanate,” J. Mater. Sci., vol. 30, no. 10, pp. 2463–2474, 1995. A. von. Meier and John Wiley & Sons., Electric power systems a conceptual introduction. Hoboken, N.J.: IEEE Press : Wiley-Interscience, 2006. S. G. Kandlikar, Heat transfer and fluid flow in minichannels and microchannels. Amsterdam, Netherlands; San Diego, CA; Oxford, UK: Elsevier, 2006.